Cables and ropes, I. 781. Cadbury, Devon, I. p. 557. Cadeby (Cateby), Leic., I. g. 981 (56). Cader (i.e. Calder), laird of. See Campbell, Sir J.
Cadiz (Cales, Calix), I. 106 (p. 73), 631-2. Cadogan Lands, co. Glomorgan, II. g. 107 (19). Cadwell alias Calewell, Beds, near Ickleford, Herts, I. g. 981 (42). Cadyngtons or Caryngtons, Herts, I. p. 545. Caen Wood (Camewood), Midd., II. g. 241 (20). Caerkennen (Carykennen), in Wales, I. p. 556. Cagny, sieur de. See Mesneige, J.
Cahir or Cahir Duneske, in Ireland, I. 922. -, baron of. See Butler, Sir T.
Cairncross, Robt., bp. of Ross, q.v. Caithness (Caitnes), in Scotland, II. 539 (p. 286). Caithness, earl of, I. 664. Calabria, in Italy, I. 891. -, II. 13, 35, 84, 187, 191, 199, 231 (p. 119, 128 ter. 130 passim, 131), 259, 267, 270-1, 293, 365, 384, 391, 413, 426, 453, 460, 462, 490, 525 :App. 14 :g. 107 (37, 54), 327 (18). -, II. 17, 64, 125, 204, 270-1, 426, 438. -, banished men, II. g. 107 (37). -, Rowse, Ant. (Aug. 1543). -, -, letter from, 967. -, -, clerk. See Wade. -, customer of, I. 683. -, French secretary at. See Benolt, J. -, French subjects at, II. 204, 270-1 : App. 14. -, knight porter. See Knyvett, Sir A. -, labourers at, I. 524 (3). -, King's storehouse, I. 524 (1, 4). -, master of Ordnance at. See Browne, G.
-, men at arms of, II. 64. -, merchants of the Staple, I. 76, 436 (f. 86), 956 :g. 100 (36), 623 (101). -, II. 231 (p. 128). -, II. 17, 249 (2). See Burgate, Wm. -, treasurer of, I. g. 100 (36). See Wotton, Sir E.
-, victualling of, I. 55, 267, 524, 675 (p. 390), 681, 685. -, watches in, II. 64. Anderne, I. 97, 216, 641. -, Matthias of, his sayings, I. 666ii. Castle, lieutenant. See Bray, Sir E.
East Pale, I. 295 (pp. 165-6). Fiennes (Fynes). See under F.
Main Brook (Myn Broke), II. 64. Marke and Oye, II. 204. Marshes (the Marresse, Marrys, Marish, Maris), I. 256, 470, 524 (3), 832 (p.469). -, II. 231 (p. 130). New River, II. 231 (p. 130). -, captain of. See Carew, Sir G.
-, lieutenant of. See Carew, T.
St. Inglebert. See below. Sandingfield. Sandingfield (Sannyngfeld) or St. Inglebert, I. 41, 354 (2). -, college or house of, I. 34, 50. Staple. See above, merchants of the Staple. West Pale, I. 295 (p. 166). Calais (Calis, Cales), pursuivant, I. 142, 179, 349, 484. Calcot, Thos., servant to Mr. Shether, II. 546 (pp. 318, 327-8, 330, 333, 339, 343, 356, 358, 362, 371). -, -, letter from, II. 546 (p. 318). Caloote, alias Calcott, alias Caldicott, Glouc., II. g. 107 (8, 47). Calcot Mill, in Tilehurst, Berks, I. g. 802 (67). Caldbeck (Calbecke), Cumb., I. g. 981 (60). Caldbek, Thos., vicar of Bubwith, I. 649. Calde, co. Pembroke, II. g. 449 (26). Caldecot (Colcott), Hants. I. g. 981 (97). Caldecote, Annabel, I. g. 981 (8). Caldeham, Gabriel, I. g. 981 (51). Calder (Caldour). See Campbell, of C.
Calder, laird of. See Sandilands, Sir James. Calengewood, Staff., I. 66 (c. 44). Callard, , I. 832 (p. 467). Callaughton (Calloughton), Salop, II. g. 449 (25). Calshott (Calshorte) bulwark, Hants, II. 231 (p. 128). -, Ph., I. 832 (p. 467). Calton, Roger, I. g. 226 (79 p. 132). Calverde, Ric.,II. g. 241 (19). 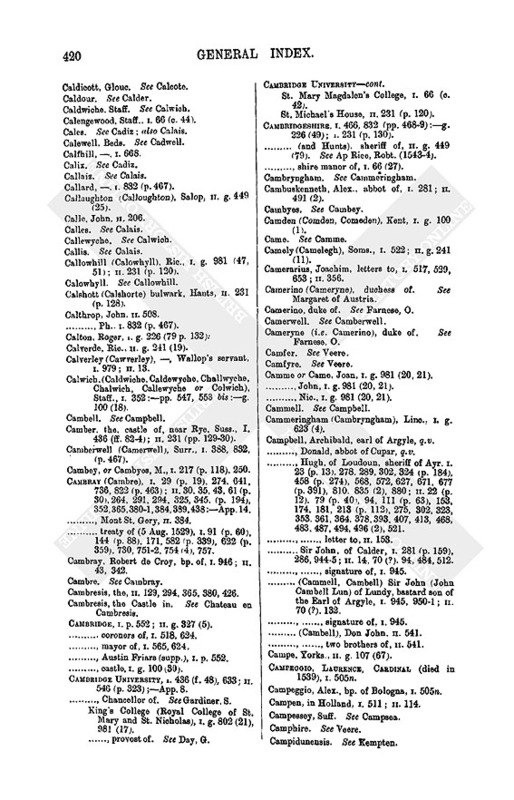 Calwich, (Caldwiche, Caldewyche, Challwyche, Chalwich, Callewyche or Colwich), Staff., I. 352 :pp. 547, 553 bis :g. 100 (18). -, II. 231 (pp. 129-30). Camberwell (Camerwell), Surr., I. 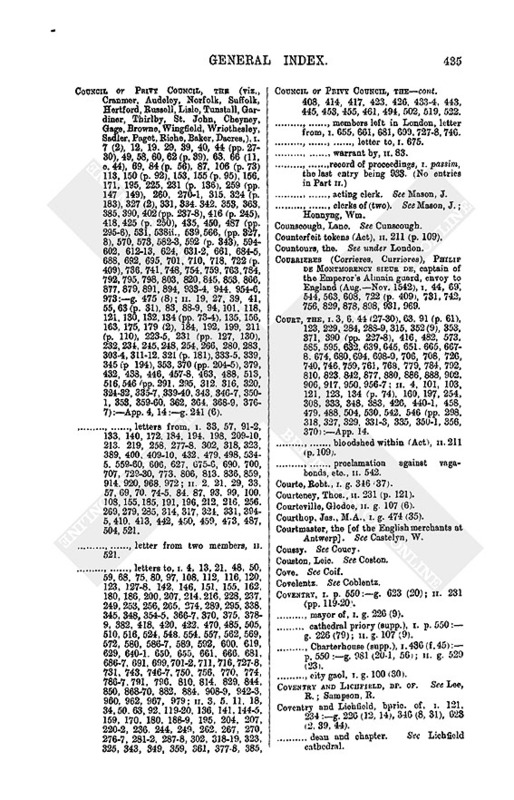 388, 832, (p. 467). Cambey, or Cambyes, M., I. 217 (p. 118), 250. -, II. 30, 35, 43, 61 (p. 30), 264, 291, 294, 325, 345, (p. 194), 352, 365, 380-1, 384, 389, 438 :App. 14. -, Mont St. Gery, II. 384. -, treaty of (5 Aug. 1529), I. 91 (p. 60), 144 (p. 88), 171, 582 (p. 339), 622 (p. 359), 730, 751-2, 754 (4), 757. Cambresis, the, II. 129, 294, 365, 380, 426. Cambresis, the Castle in. See Chateau en Cambresis. -, II. g. 327 (5). -, coroners of, I. 518, 624. -, mayor of, I. 565, 624. -, Austin Friars (supp. ), I. p. 552. -, II. 546 (p. 323);App. 8. -, Chancellor of. See Gardiner, S.
King's College (Royal College of St. Mary and St. Nicholas), I. g. 802 (21). 981 (17). -, provost of. See Day, G.
St. Mary Magdalen's College, I. 66 (c. 42). St. Michael's House, II. 231 (p. 120). -, I. 231 (p. 130). - (and Hunts), sheriff of, II. g. 449 (79). See Ap Rice, Robt. (1543-4). -, shire manor of, I. 66 (27). Camden (Comden, Comeden), Kent, I. g. 100 (1). -, II. g. 241 (11). Camerino (Cameryne), duchess of. See Margaret of Austria. Cameryne (i.e. Camerino), duke of. See Farnese, O.
Camme or Came, Joan, I. g. 981 (20, 21). -, John, I. g. 981 (20, 21). -, Nic., I. g. 981 (20, 21). Cammeringham (Cambryngham), Linc., I. g. 623 (4). Campbell, Archibald, earl of Argyle, q.v. -, Donald, abbot of Cupar, q.v. -, II. 22 (p. 12), 79 (p. 40), 94, 111 (p. 63), 153, 174, 181, 213 (p. 112), 275, 302, 323, 353, 361, 364, 378, 393, 407, 413, 468, 483, 487, 494, 496 (2), 521. -, -, letter to, II. 153. -, II. 14, 70 (?). 94, 484, 512. -, -, signature of, I. 945. -, II. 70 (? ), 132. - (Cambell), Don John. II. 541. -, -, two brothers of, II. 541. Campe, Yorks., II. g. 107 (67). Campeggio, Laurence, Cardinal (died in 1539), I. 505n. Campeggio, Alex., bp. of Bologna, I. 505n. Campion, Chr. II. 231 (p. 119). -, Thos., I. p. 548. Campsea (Canpesse, Campessey) or Campsea Ash, Suff., nunnery (supp. ), II. g. 449 (18). Camswell, Mich., I. p. 550. Canary (Canare) island, I. 106 (p. 73). Candekele, Yorks., I. g. 226 (66). -, II. g. 449 (32). "Candicasei", Priour. See Whithorn, prior of. "Candicasie", Andreas. See Durie, A.
Candlemas, and hallowed candles, I. 546 (pp. 91. 293-6. 300-3, 311, 313). Canefelde, Ricardus de. former rector of Tannington, I. g. 623 (12). Canegate, the Northumberland river, II. 538. Canne, Thos., I. 436 (f. 33). Cannings (Cannynges), Bishops-, Wilts, I. g. 981 (5). Cannington (Canyngton), Soms., I. g. 474 (36). -, II g. 449 (49). Cannon, John, II. 231 (p. 120). Cannonby (Canybe), in Scotland, I. 273. Cano di Creo. See Capo de Creo. -, II. g. 107 (8,15). Canons Leigh (Canonleigh), abbey (supp. ), in Burlescombe parish, Devon, I. g. 802 (37). Canons (Cannons) manor, Midd., I. g. 623 (43 p. 364). Canos, Anthoine de, of Charles V's court, signature of, I. 488. Cant, Pieter, vice-admiral of Flanders, I. 356, 390, 416 (p. 246). -, -, letter to, I. 356. -, II. 231 (pp. 120, 123), 260, 504, 546 passim. -, butcher's wife of, in prison at Calais for heresy, I. 447, 466. -, tailor of, expounding the Bible, II. 546 (p. 291). -, mayor of. I. 469. -, privileges of (Act), I. 66 (22). All Hallows (Alhalond) or All Saints, II. 546 (pp. 310, 313, 318). -, parson of, II. 546 (p. 313). Archbishop's palace (burnt, Dec. 1543), II. 504, 546 (p. 359). -, II. 546 (pp. 320-1). -, II. 546 (pp. 292-3, 295, 301, 304-6, 316, 322, 327, 331, 337, 339, 349, 373-4, 376, 378) :g. 449 (37). -, appointment of preachers of the Old and New Learning, II. 546 (pp. 323, 333-4, 337, 344-5, 348, 353, 355-6, 361, 364, 376). -, prebendaries of, II. 546 passim. -, Ralph the bell-ringer, II. 546 (p. 300). -, II. 231 (pp. 119, 123 bis, 132). -, cellarer. See Cross, J.
Courtop Street (Colver Strette, Cutupstrete), Our Lady of, II. 546 (pp. 303, 319). Flowredelice, II. 546 (p. 329). Langport alias Le Barton manor, I. p. 552. Northgate (Norgatt, Norgate) parish or St. Mary de Northgate, II. 546 (pp. 300, 307, 309, 312-13, 346, 365-67). -, vicar of. See Kempe, W.
Old Park, I. p. 555. St. Alphage's (St. Elphies, St. Alpheis, St. Elphin's). II. 546 (pp. 303-4, 310, 313-14, 342, 347, 352). -, parson or "curate" of. See Chirden, H.
St. Andrew's, II. 546 (pp. 300, 309). -, II. 546 (pp. 303, 319 . St. Dunstan's, II. 546 (p. 301). St. George's, II. 546 (pp. 309, 354, 367). -, parson of. See Tofer, J. -, -, his curate. See Paris, J.
St. John's, II. 546 (p. 312). St. John's hospital, II. 546 (pp. 312, 345, 366). -, master of, II. 546 (p. 291). St. Mary Mawdelen, parson of. See Smith, Mr.
St. Mary of Northgate. See above, Northgate. St. Mary's hospital, of the Poor Priests, II. 260. St. Mildred's, II. 546 (p. 300). -, II. 546 (p. 363). -, vicar of, II. 546 (pp. 296, 306, 323, 342). St. Peter's, II. 546 (pp. 299, 313). St. Thomas's hospital, II. 546 (p. 358). -, chantry priest of, II. 546 (p. 358). Westgate, II. 546 (p. 314). -, Archbishop of. See Cranmer, T.
-, also Warham, W. (1504-32). Canterbury, archbishopric of, I. 66 (29, c. 37). -, archdeacon of. See Cranmer, E.
Canterbury, province of, I. g. 100 (31). Canterbury, Wm., I. 436 (f. 19). Cantilupe, lord, II. g. 241 (25). Cantrecelly, in South Wales, I. g. 226 (41). Capel (Capell). Surr., I. g. 226 (79). Capel or Capell, Edw., I. 832 (p. 467). -, Sir Giles, I. 832 (p. 467) :g. 100 (23). -, Sir Hen., I. g. 100 (32). -, Ric., I. g. 474 (17). Capheaton (Capthetune), Nthld., I. 153. Caple, Wm., I. g. 981 (27). Capo de Creo, in Spain, I. 520ii (? "Cano di Creo"). Capo di Ferro. Hieronimo, Papal Datary, Nuncio in France, letters from, I. 35, 82, 154. -, II. g. 241 (6), 327 (9). Capper, Ric., I. p. 545. Capple (Capull), Westmld., II. g. 327 (16). Capput, provost of. See Strozzi, L.
Caput Egue (qu. Castel Ejo ? ), in Morocco, I. 106 (p. 73). Cardinal, the [of Scotland]. See Betoun, D.
-, II. 37, 68 (p. 34), 485. -, -, creation of, I. 818. Care, co. Pemb. See Carew. Carell, John, I. g. 802 (41). Carew (Care), co. Pembroke, I. g. 346 (15). Carew (Carrow, Carowe), Gawen, I. 426, 832 (pp. 467, 469 bis). -, II. 12, 13, 43, 65, 92, 129, 187. 226, 266-7, 310, 325, 345 (p. 194), 347, 352, 365, 413. -, - signature of, II. 12, 43, 65, 129, 187, 267, 325. -, -, receipts from his lands, II. 226. -, Lady Malina, I. g. 981 (96). - (Carrowe), Peter, I. 832 (p. 468 bis), 979 :p. 555. -, Sir Ric., dec., I. g. 981 (96). - (Caro), Thomas, lieutenant of Risebank (1543), I. 420, 524, 967 :I. g. 802 (86). -, -, signature of, I. 420, 967. -, II. 231 (p. 125). Carham (Carram), Nthld., II. 295, 538 (p. 285). Carhill farm, Yorks., I. p. 555. Carignan, in Piedmont, II. 454. Carillon, Lopes de, I. 377. Carion, Diego Ortega de, I. 947. Carkin (Karken), Yorks., I. p. 549. Carlep (Carnylippes), in Scotland, II. 237(2). Carles, Robt., I. g. 802 (3). Carleton Paynell, Linc., I. g. 623 (13). Carlingford. in Ireland. I. 721. -, II. 36, 93, 147, 159, 170, 180, 207, 231 (pp. 126, 128), 237 (2), 395, 463, 483, 494. -, II. 173, 263, 339-40, 422, 469. -, deputy customer of, I. 627. -, distances to Edinburgh, etc., II. 237 (2). -, captain of. See Wharton, Sir T.
-, II. 137, 395 (2). - -, repairs at, II. 395 (2), 463. - Cathedral, I. 799 :g. 981 (99). - -, dean of, I. 583. Carlisle, Bp. Of, I. 799. See Aldridge, R.
Carlisle (Carlile), Thos., II. 372. Carlow (Caterlagh), in Ireland, I. 646. Carlton (Carleton), Cumb., I. g. 802 (51). -, II. g. 449 (53). Carlton or Carleton, , I. 967. - (Carrelton), captain, II. 453. -, Gerard, dean of Peterborough (16 Feb. 1543), I. g. 226 (57). -, John. II. 231 (pp. 119, 120). Carmarthen (Karmerdyn, Kermerden), Old and New, I. p. 450 :g. 802 (34). -, Castle, I. g. 623 (71). -, Friars Minors (supp. ), I. g. 226 (22). - Priory (supp. ), I. p. 550 :g. 981 (20-1). -, Kaystrete, I. g. 226 (22). -, St. Peter's, I. g. 226 (22), 802 (34), 981 (21 p. 531). -, King's school or Thomas Lloyd's school, I. g. 226 (22). -, -, charter of, I. g. 226 (22). Carmarthenshire, escheator of, II. g. 449 (59). Carmichael (Carmyghell), Andrew, I. 61. -, II. 231 (p. 126). 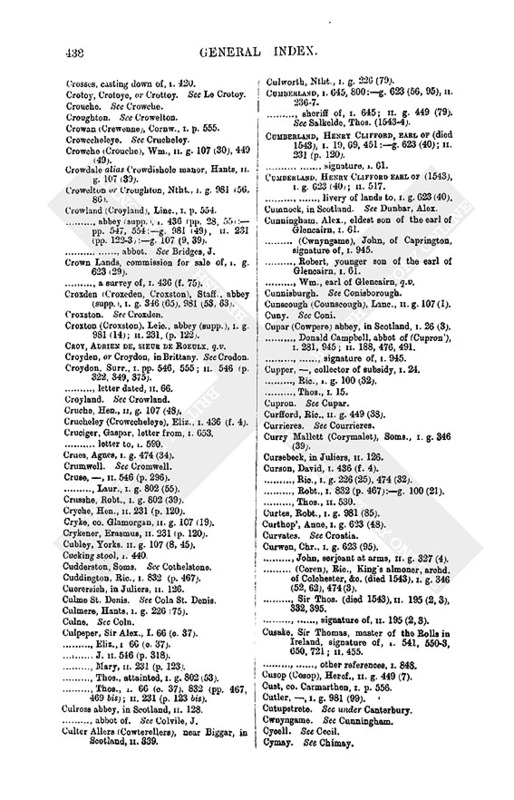 Carnabys, the Northumberland family, I. 141 (p. 87). Carnarvon, in Wales, Exchequer in, I. g. 346 (4). Carnarvonshire, I. g. 802 (7, 76). -, II. 231 (p. 120) :g. 107 (22, 43). Carnebe. David, a Scot, I. 682. Carnock (Carno, Carnoth), in Scotland. 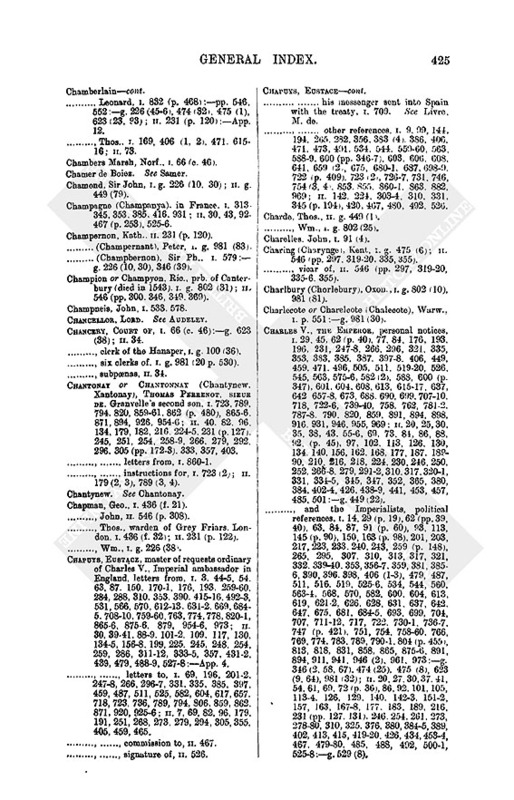 See Drummond, of C.
-, -, other reference, I. 542. -, II. 131, 295, 297-8. -, John, I. p. 554. -, Marg., I. g. 346 (66 p. 202). Carr, Scottish surname. See Kerr. Carre, Scottish surname. See Kerr. Carres, Mons. de. See Kar. Carrick pursuivant, I. 281 (p. 159). Carrickfergus, in Ireland, I. 553. Carrow or Carrowe. See Carew. Cars, M. de. See Kar. Carsley (Kersley), Warw., I. g. 981 (20, 21). Carssye, Carsse or Carssie. See Menteith, laird of Kerse. Carter, the, on the Scottish Border, II. 538 (p. 285). Carter, Robt., I. g. 474 (27). Cartewright or Cartwright, Hen., II. 231 (p. 120) :g. 107 (55). -, II. 74 (p. 38), 543. -, John, I. p. 556. Carykennen, in Wales. See Caerkennen. Caryngton or Cadyngtons, Herts, I. p. 545. Casie, John Baptist. See Cassia. Cassano (Casane), in Milan, I. 505. Cassia (Casie), John Baptist, LL.D., prb. of Canterbury (died 1543), II. g. 449 (37). Cassies farm, Worc., I. g. 981 (57). -, II. 2, 14, 22 (p. 12), 33, 44, 46, 51, 72, 79 (p. 40), 85, 94. 111 (pp. 62-3), 116, 127, 138, 153, 174, 180, 188, 202 (p. 105), 213 (p. 112), 231 (126), 235 (p. 134), 255, 257, 269, 275, 282, 288-9, 302, 314, 323, 339, 353, 364, 378, 407, 408 (p. 219), 417, 428, 440, 447, 483, 494-6, 502. -, -, letter from, I. 38. -, II. 153, 289, 495. -, -, handwriting of, I. 37 (2). -, -, his wife, II. 33. Castel de la Chappelle. See La Chapelle. Castel Ejo, in Morocco, I. 106 (p. 73 ? "Caput Egue"). Castell, Andrew, I. 73, 315. -, -, examination of, I. 73 (3). Castellazo, Camillo, I. 231 (p. 136). Castellhill, Yorks., I. g. 226 (66). Castelnuovo (Castello Novo), taken from the Turks (27 Oct. 1538) and retaken by them (7 Aug. 1539), I. 144 (p. 88), 397, 406 (1,3), 582 (2), 588. Castel Santo Giovanni (Castel St. John's), in Italy, I. 688. Castelyn (Castelen), John, II. 546 (p. 308). -, Simon, II. 546 (p. 311). - (Castlyn), Wm., governor of the English merchants at Antwerp, or courtmaster of the English nation there, I. 331, 487 (p. 296), 560, 589, 731, 735, 743, 756-7, 773, 829, 925. -, -, letter from, I. 735. Casthorpe (Castrop), Linc., II. g. 449 (44). -, constable of. See Frias, duke of. -, Cortez (Courtes) of, I. 231. Castillon, Louis de Perreau Sieur De, French ambassador in England (1537 to 1539), I. 217. Castle Milk (Castle of Mylke) in Scotland, II. 236 (3). Castleshaw (Castylshaw), Yorks., I. g.802 (24). Castleton (Castelton), Lanc., I. g. 226 (1). Castor (Caster), Ntht., I. g. 981 (85). Castro, Duke Of. See Farnese, Pier Luigi. Catcot (Catcott), Soms., I. g. 226 (77), 623 (78). Catebye manor, Leic., II. g. 107 (56xii). Catesby, Ntht., nunnery (supp. ), II. g. 529 (30). Cathanger (Cattanger), Soms., I. g. 346 (19, 37). Catillon sur Sambre (Castillons), in Hainault, I. 946. Catmerhall, Essex, II. g. 327 (11, 15). Catteley (Catley). priory (supp. ), Linc., I. g. 476 (4), 623 (4, 13). Cattle (nowt). I. 256, 353, 586, 641, 898, 903 : g. 226 (77), II. 173 (2), 181, 295, 297-8, 372, 518. Catton and Catton Northby, Yorks., I. g. 226 (66). Cauncle or Canuncle, Joan. I. g. 981 (53, 101). -, John, I. g. 981 (53, 101). Caustons, Midd., I. p. 547. Cave, Mr., II. 205, 460. -, Ambrose, II. App. 14. -, Ant., II. 490, 507 :App. 14. -, -, letter from, II. 490, 507. -, -, his wife, II. 507. -, Brian, I. g. 981 (21 p. 531). -, Fras., II.231 (p. 120) :g. 449 (5). -, Marg., II. g. 449(5). Cavendish (Candysshe), Sir John, I. 649 : p. 556, II. 193. -, II. 231 (p. 123 bis). -, II. g. 449 (2). Cawarden or Carden, Eliz., wife of Thos. II. g. 241(6). -, II. 231 (p. 131 ter.). -, Thos., vicar of Lympne, II. 546 (p. 306). Cawby, Thos., parson of Wiohling. See Dawby. Cawdburne Rodde, on the Scottish Border, II. 538 (p. 285). Cawson or Cawston, John, I. g. 981 (56, 98 bis). - Thos., I. g. 802 (89). Cawthorne, Yorks., I. g. 100 (33). Cawthorpe (Cowthorpe), Linc., I. g. 981 (110). -, II. g. 529 (8). Cayppes. Mr., II. 546 (p. 341). Caythorpe (Cathorpe), Linc., I. g. 981 (56). -, II. 231 (p. 119) :g. 449 (79). Celsay, Eliz., II. 546 (p. 300). Cely, Geo., II. g. 529 (10). Ceremonies of the Church, II. 546 (pp. 293-5, 300, 306-7, 311, 331, 350). Cerne, Dors., abbey (supp. ), II. g. 107 (70). Cessford (Sesforthe), laird of. See Kerr, W.
Chabot, Ph., sieur de Brion, q.v. Chace, Robt., I. g. 226 (79 p. 131). Chacombe (Chaccombe), Ntht., II. g. 107 (53). -, II. g. 107 (53 , 449 (5). Chaddesley (Chaddisley), Worc., II. g. 241 (27, 30). Chaderton (Chatterton. Chattreton) John, of Portsmouth, I. 169, 179, 181, 301. Chadlington, Oxon. I. g. 802 (10), 981 (81). Chadyngton, Oxon, I. g. 226 (79). Chaffer, John, II. g. 107 (1). -, Robt., I. 436 (f. 19). Chalcott, Walter, I. g. 226 (26). Chalcroft, John, I. g. 346 (11). Chaldwell, Essex, II. g. 449 (64). Chale, I. of Wight, I. g. 981 (46). Chalk (Chalke), Kent, I. p. 551. Challers manor, Herts, II. g. 449 (67). Challock (Challok, Chalcocke), Kent, I. p. 556. - vicar of, Sir Laurence, II. 546 (p. 296). Chalmerlan. M. I. See Fleming, lord. Chaloner, Ralph, I. g. 346 (66 p. 202). Chalueleighe, Devon, II. g. 241 (8). Chamber (Chambre). John, M.D., treasurer of Wells cathedral, II. g. 449 (10). Chamberlain or Chamberleyn, Dorothy, wife of Leonard, I. g. 226 (46), 623 (23). -, Sir Edw., I. g. 623 (23). -, II. 231 (p. 120) :App. 12. Chambers Marsh, Norf., I. 66 (c. 46). Chamer de Boiez. See Samer. -, II. 30, 43, 92. 467 (p. 253), 525-6. Champernon, Kath., II. 231 (p. 120). - (Champernant), Peter, I. g. 981 (83). - (Champbernon), Sir Ph., I. 579 : g. 226 (10, 30), 346 (39). -, II. 546 (pp. 300. 346, 349, 369). Champneis, John, I. 533, 578. -, clerk of the Hanaper, I. g. 100 (36). -, six clerks of, I. g. 981 (20 p. 530). -, II. 40, 82, 96, 134, 179, 182, 216, 224-5, 231 (p. 127). 245, 251, 254, 258-9, 266, 279, 292. 296, 305 (pp. 172-3), 333, 357, 403. -, -, letters from, I. 860-1. -, II. 179 (2, 3), 789 (3, 4). Chapman, Geo., I. 436 (f. 21). -, John, II. 546 (p. 308). -, Wm., I. g. 226 (38). -, II. 30, 39-41, 88-9. 101-2, 109, 117, 130, 134-5, 156-8, 199, 225, 245, 248, 254, 259, 286, 311-12, 333-5, 357, 431-2, 439, 479, 488-9, 527-8 :App. 4. -, II. 7, 69, 82, 96, 179, 191, 251, 268, 273, 279, 294, 305, 355, 405, 459, 465. -, -, commission to, II. 467. -, -, signature of, II. 526. -, - his messenger sent into Spain with the treaty, I. 709. See Livre, M. de. -, II. 142, 224, 303-4, 310, 331, 345 (p. 194), 420, 467, 480, 492, 526. Charde, Thos., II. g. 449 (1). -, Wm., I. g. 802 (25). Charelles. John, I. 91 (4). -, II. 546 (pp. 297, 319-20, 335, 355). - vicar of, II. 546 (pp. 297, 319-20, 335-6. 355). Charlbury (Chorlebury), Oxon., I. g. 802 (10), 981 (81). Charlecote or Charelcote (Chalecote), Warw., I. p. 551 :g. 981(30). -, II. 20, 25, 30, 35, 38, 43, 55-6, 69, 73, 84, 86, 88, 92, (p. 45), 97, 102, 113, 126, 130, 134, 140, 156, 162, 168, 177, 187, 189-90, 210, 216, 218, 224, 230, 246, 250, 252, 266-8, 279, 291-2, 310, 317, 320-1, 331, 334-5, 345, 347, 352, 365, 380, 384, 402-4, 426, 438-9, 441, 453, 457, 485, 501 :g. 449 (22). -, II. 20, 27, 30, 37, 41, 54, 61, 69, 72 (p. 36), 86, 92, 101, 105, 113-4, 126, 129, 140, 142-3, 151-2, 157, 163, 167-8, 177, 183, 189, 216, 231 (pp. 127. 131), 246, 254, 261, 273, 278-80, 310, 325, 376, 380, 384-5, 389, 402, 413, 415, 419-20, 426, 434, 453-4, 467, 479-80, 485, 488, 492, 500-1, 525-8 :g. 529 (8). -, II. 7, 80, 96, 178-9, 251, 258, 264, 292, 294, 305-6, 322, 336-7, 341-2, 354-5, 366, 401, 405, 456, 464-6. -, II. 39, 134, 156, 161, 243, 253, 286, 296, 300, 333, 368, 418, 431, 527. - asked to declare against the Scots, II. 296, 331 (p. 188), 420, 434. -, his claims against France, I. 397. -, English force sent to his aid (for earlier references see Musters and for later see under Flanders), I. 657-8, 674-5, 681, 685, 690, 704, 707, 710, 715-16, 718, 722, 727, 729-30, 742, 759, 762-3, 771, 773, 789 (1, 3), 798, 820, 822. -, numbers and order of his army, II. 321 (2). of Ferrara, II. 403, 457. Venetian, I. 642, 673, 724. -, captain of his Noire Bende, II. 385. -, his Court, II. 73 (p. 37), 126, 142, 403 (p. 217), 458. -, his children, I. 217. -, his daughter. See Mary of Castile. -, his jewels, II. 224. -, his Master of the Horse. See Boussu. comte de. -, his mother. See Joan. -, his Privy Chamber, I. 406. -, II. 27, 55, 69, 96, 129, 134, 167, 216, 267, 305, 331, 333, 369, 420, 434, 467 (2), 488, 525-6 :App. 4. -, -, the document, I. 144. -, -, extract from, II. 216 (2, 3). -, -, Charles V.'s "annotations" upon, I. 406 (3). -, -, his commission for receiving Henry's oath, I. 396, 406, 612. -, -, his ratification and oath, I. 339, 383, 397, 406, 471, 487, 534, 566, 582, 588, 684. -, -, -, the documents, I. 339, 383. -, -, Henry VIII. 's commission to Bonner to get the Emperor's ratification, I. 164. -, -, Henry's oath, I. 396-7, 511, 534, 600, 603, 606, 608, 612-13, 820, 875. -, -, -, the text, I. 603. -, his truce with Denmark, I. 332. - will of, codicil added, I. 488. -, II. 30, 65, 150, 183, 190, 291, 294, 333. -, -, letter from, II. 150. -, -, proposed marriage with Constantia Farnese, I. 575. -, -, - with Princess Mary. See Mary. -, -, - with Mary Queen of Scots, I. 12. Charleton, Bucks., II. g. 529 (30). See also Charlton, Ntht. Charleton, Salop, I. p. 545. Charley, Leic., II. g. 107 (10). Charloys or Charlois. See Charolois. Charlton (Charleton), Dors., II. g. 449 (1). Charlton (Charleton), Hants, II. g. 241 (31). Charlton, Ntht. (Charleton, Bucks. ), II. g. 529 (10, 30). Charlton (Charleton) next Malmesbury, Wilts., II. g. 529 (11). -, II. g. 107 (56). - (Charleton), Wm., I. g. 226 (27). 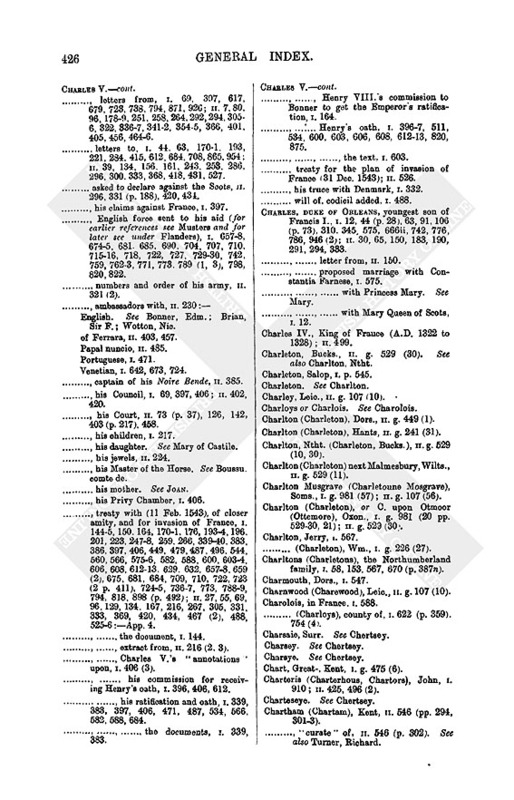 Charltons (Charletons), the Northumberland family, I. 58, 153, 567, 670 (p. 387n). Charnwood (Charewood), Leic., II. g. 107 (10). Charolois, in France, I. 588. - (Charloys), county of, I. 622 (p. 359), 754 (4). Chart, Great-, Kent, I. g. 475 (6). -, II. 425, 496 (2). Chartham (Chartam), Kent, II. 546 (pp. 294, 301-3). -, "curate" of, II. 546 (p. 302). See also Turner, Richard. Chassingny, , captain of Heinsberg, I. 544, 658. Chasteaubriant, Mons. de. I. 62 (p. 40), 106 (p. 73). Chastelhnoy, in France, I. 622 (p. 359). Chastel Synon. See Chateau Chinon. Chastleton (Castelton), Oxon, I. g. 802 (10), 981 (81). Chateau Chinon (Chastel Synon, Chastelchinon), in France, I. 622 (p. 359). -, II. 92, 264, 321, 341-2, 345, 380, 384 :App. 14. -, letters dated at, II. 345-6. Chatham (Chetham), Ric., I. 436 (f. 19). Chatteau Cambrasy. See Chateau en Cambresis. Chattendon (Chatyngdon), in Frindsbury, Kent, I. 66 (c. 41). Chattovene, sieur de, II. 499. See also La Brosse. Chaunceller, Ric., warden of Higham Ferrers (temp. Hen. VII. ), I. g. 474 (27). Chaundeler, Joan, I. g. 623 (18). -, John, I. g. 623 (18). -, Thos., I. g. 981(20, 21). -, Mrs., II. App. 14. - (Chauntryll), Jane, I. 436 (f. 30). -, Robt., I. g. 226(9). Chaverbenton (Chauerbenton), in Scotland, II. 208. Chaworth, Sir John, I. g. 100 (26), 226 (48). -, John, I. g. 802 (82). Chaynes Court, Wilts, II. g. 241 (11). Cheadle, Hounds- (Hundes Chedull), Staff., I. g. 981 (53). Checheley, Robt., I. g. 474 (27 p. 283). - (Chicheley), Thos., I. 832 (p. 468) : g. 226 (8). Chedworth, Glouc., I. g. 346 (42). -, II. 231 (p. 130), 249 (2). Chelsea, Midd., I. g, 226 (75). Chelsfield (Chelisfelde), Kent, I. g. 981 (83). Chelson, Soms., I. g. 474 (36?, "Chellon"). Chelworth, Wilts, I. g. 981 (56, 98). Cheman or Chemans M., president of Turin, I. 106 (pp. 72-3), 113 (77), 140, 163 (p. 98). Chenay or Cheney. See Cheyney. -, - prior. See Marshall, J.
Chepyng Onger, Essex. See Ongar. Cherbourg (Scherborow, Cherrebroke), in France, II. 23-4. 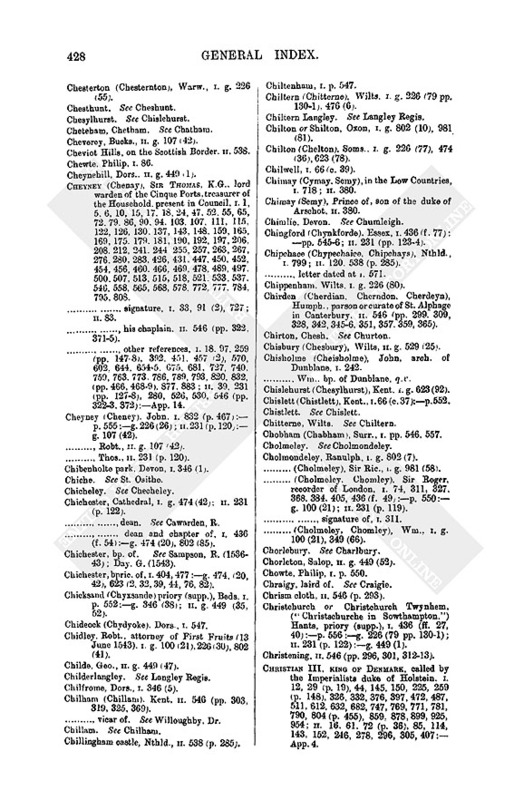 Chertsey (Charsey, Charteseye, Charsaie, Charsye). Surr., I. p. 557. Chesell. See under Winchester, St. Peter's Chishill. Cheseman, Robt., I. 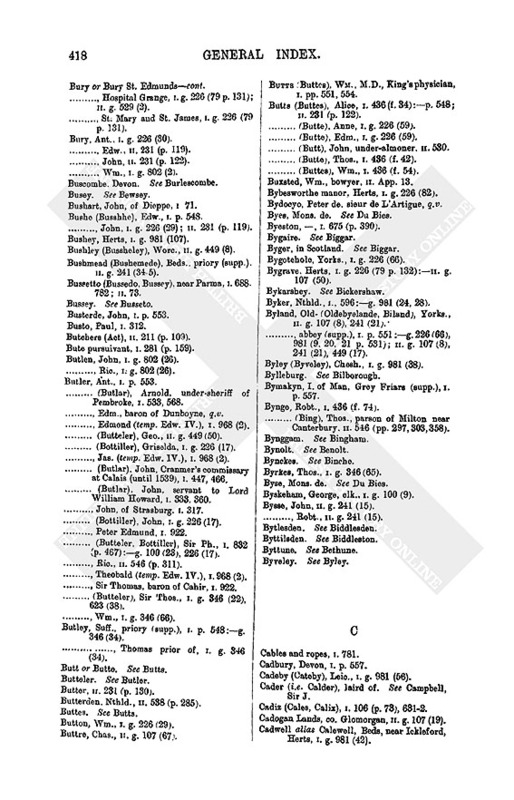 832 (p. 467) :g. 100 (21). Chesham (Chessham), Dr., I. 107. -, II. 211 (p. 110), 237. -, II. 211 (p. 110). Cheshunt (Chesthunt), Herts, II. g. 449 (50). -, -, prioress See Hill, M.
-, II. g. 107 (51). -, writ to mayor and sheriffs, II. 509. -, Parliamentary representation (Act), I. 66 (17). -, sanctuary (Act), II. 211 (p. 109). - cathedral, I. g. 346 (63). -, -, prioress. See Grosvenour, Eliz. -, St. Mary's rectory, I. g. 474 (35). -, -, abbot. See Birchenshawe. Chester, John, I. g. 226 (75), 623 (101). Chester in the Street, Dham., I. g. 981 (73). Chester juxta Wigan, Lanc., II. g. 107 (1). -, II. g. 107 (25). -, II. g. 241 (34). Chesterton (Chesternton), Warw., I. g. 226 (55). Cheverey, Bucks., II. g. 107 (42). Cheviot Hills, on the Scottish Border, II. 538. Cheynehill, Dors., II. g. 440 (1). Cheyney (Chenay), Sir Thomas, K.G., lord warden of the Cinque Ports, treasurer of the Household, present in Council, I. 1, 5, 6, 10, 15, 17, 18, 24, 47, 52, 55, 65, 72, 79, 86, 90, 94, 103, 107, 111, 115, 122, 126, 130, 137, 143, 148, 159, 165, 169, 175, 179, 181, 190, 192, 197, 206, 208, 212, 241, 244, 255, 257, 263, 267, 276, 280, 283, 426, 431, 447, 450, 452, 454, 456, 460, 466, 469, 478, 489, 497, 500, 507, 513, 515, 518, 521, 533, 537, 546, 558, 565, 568, 578, 772, 777, 784, 795, 808. -, -, his chaplain. II. 546 (pp. 322, 371-5). -, II. 39, 231 (pp. 127-8), 280, 526, 530, 546 (pp. 322-3, 372) :App. 14. -, II. 231 (p. 120) : g. 107 (42). -, Robt., II. g. 107 (42). -, Thos., II. 231 (p. 120). Chibenholte park, Devon, I. 346 (1). -, -, dean. See Cawarden, R.
-, -, dean and chapter of, I. 436 (f. 54) :g. 474(20), 802(85). Chichester, bpric. of, I. 404, 477 :g. 474, (20, 42), 623 (2, 32, 39, 44, 76, 82). -, II. g. 449 (35, 52). Chideock (Chydyoke). Dors., I. 547. Chidley. Robt., attorney of First Fruits (13 June 1543). I. g. 100 (21), 226 (30), 802 (41). Childe, Geo., II. g. 449 (47). Chilfrome, Dors., I. 346 (5). Chilham (Chillam). Kent, II. 546 (pp. 303, 319, 325, 369). -, vicar of. See Willoughby, Dr.
Chillingham castle, Nthld., II. 538 (p. 285). Chiltern (Chitterne), Wilts, I. g. 226 (79 pp. 130-1), 476 (6). Chiltern Langley. See Langley Regis. Chilton or Shilton, Oxon, I. g. 802 (10), 981 (81). Chilton (Chelton), Soms., I. g. 226 (77), 474 (36), 623 (78). Chilwell, I. 66 (c. 39). Chimay (Semy), Prince of, son of the duke of Arschot, II. 380. -, II. 231 (pp. 123-4). -, II. 120. 538 (p. 285). -, letter dated at I. 571. Chippenham, Wilts, I. g. 226 (80). Chirden (Cherdian, Cherndon, Cherdeyn), Humph., parson or curate of St. Alphage in Canterbury, II. 546 (pp. 299, 309, 328, 342, 345-6, 351, 357, 359, 365). Chisbury (Chesbury), Wilts, II. g. 529 (25). Chisholme (Cheisholme), John, arch, of Dunblane, I. 242. - Wm., bp. of Dunblane, q.v. Chislehurst (Chesylhurst), Kent. I. g. 623 (92). Chislett (Chistlett), Kent., I. 66 (c. 37) :p. 552. 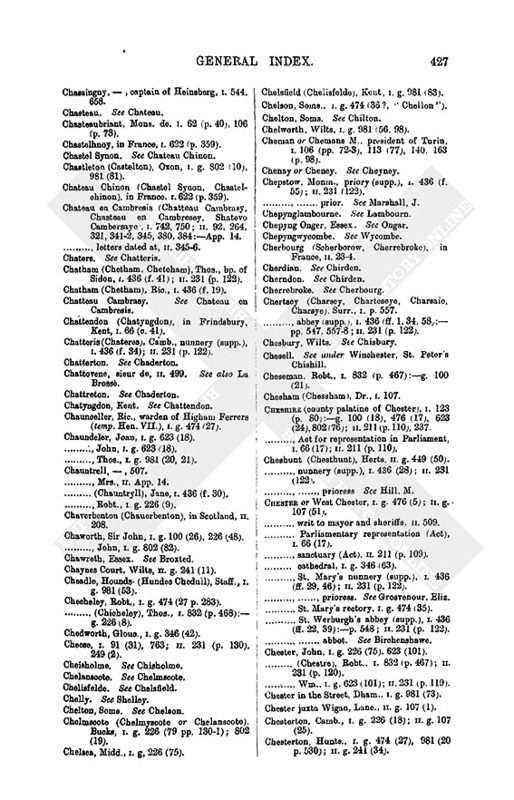 Chobham (Chabham), Surr., I. pp. 546, 557. Cholmondeley, Ranulph, I. g. 802 (7). - (Cholmeley), Sir Ric., I. g. 981 (58). -, -, signature of, I. 311. - (Cholmeley, Chomley), Wm., I. g. 100 (21), 349 (66). Chorleton, Salop, II. g. 449 (52). Chowte, Philip, I. p. 550. Chraigy, laird of. See Craigie. Chrism cloth, II. 546 (p. 293). -, II. 231 (p. 122) :g. 449 (1). Christening, II. 546 (pp. 296, 301, 312-13). -, II. 16, 61, 72 (p. 36), 85, 114, 143, 152, 246, 278, 296, 305, 407 : App. 4. -, -, his brother to be king of Scotland, I. 781, 954. -, -, his younger brother, I. 878. - -, his brothers John and Adolph (Hans and Olphe), II. 152. -, -, his sister, duchess of Prussia, I. 682. -, -, his eldest sister marries the duke of Mecklenburg, II. 152. -, -, his second son, I. 12. Christina duchess of Bar and of Milan, wife of the duke of Bar, daughter of king Christiern II of Denmark, II. 380. Christmas, John, I. 832, (467-8). -, Wm., I. 436 (f. 33). Chumleigh (Chimlie), Devon, I. g. 346 (1). Church (Churche), Lanc., I. g. 623 (84). Church Stoke (Churchstok), co. Montgomery, I. p. 554. Churton (Chirton), Chesh., II. g. 107 (51). Chyddingsell alias Chiddingeswell. Essex, II. g. 449 (63). Chyrbury priory (Supp. ), I. p. 554. Cilgerran (Gilgarran), co. Pemb., I. g. 623 (50). Cinque Ports, the, II. g. 107 (17). -, -, lord warden of. See Cheyney, Sir T.
Circote, John, I. g. 346 (66). Cirencester (Circestre), Glouc., I. p. 553 : g. 346 (35). -, II. g. 107 (3, 8), 449 (1). Claide, in Scotland, lord Fleming's town, II. 209. Claines (Claynes), Worc., I. g. 981 (47). Clanawley (Clayn Awley), in Ireland, I. 633. Claneboy (Clanyboy), in Ireland, I. 245, 553. -, captain of. See O'Neil, Phelim. Clanfield (Clanfelde), Oxon, II. g. 107 (52). 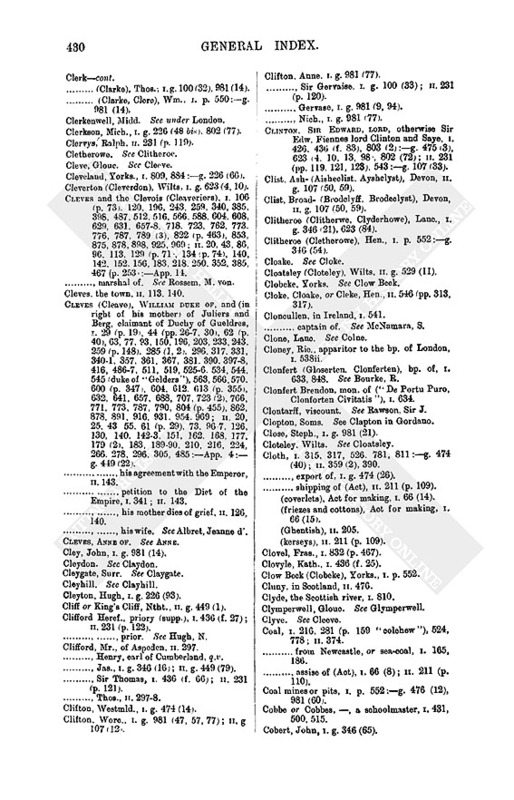 Clanricard (Clenrykard, Clanreckard), earl of, I. 552, 633-4 :g. 981 (1). See also Bourke, W.
Clantarf, bp. of, (i.e. of Clonfert). 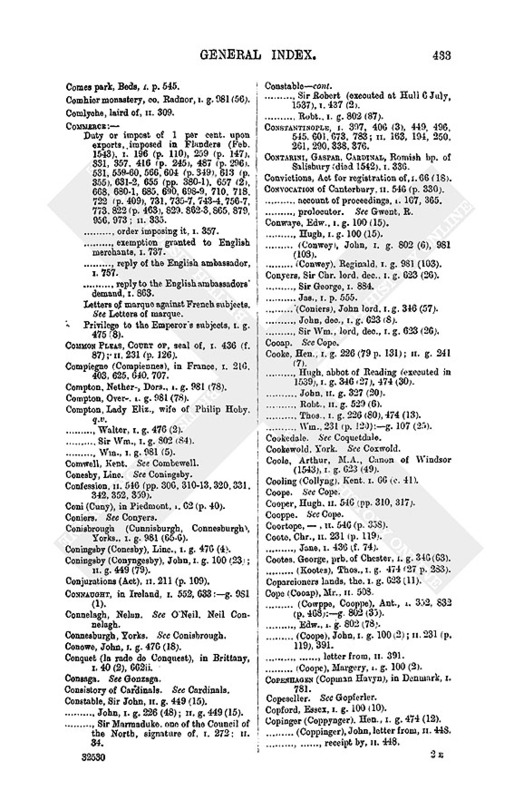 See Bourke, R.
Clanwilliam (Claymewilliam) in Ireland, I. 633. Clapton in Gordano (Clopton), Soms., I. g. 802 (62). Clare, in Ireland, monastery of, I. 634 :g. 981 (3). Clare, Robt., I. p. 549. Clarence, George Plantagenet, duke of (1461-1477), brother of Edward IV., I. g. 226 (93), 474 (1, 8, 12). Clarencieux king of arms, II. 516. Claryeaunte, i.e. Clanricard, earl of. See Bourke. Clase, Thos., Clk., I. g. 623 (43 p. 364). Clavering. Essex, II. g. 241 (22), 327 (11). Claverley (Clareley), Salop, I. g. 981 (53). Claxby, Linc., I. g. 981 (99). Claxhill, Glouc., I. g. 256 (35). Claydon, East- (East Cleydon), Bucks, I. p. 551. Claydon, Middle-, Bucks, II. g. 449 (72). Claygate (Cleygate), Surr., I. g. 474 (39). Clayhill (Cleyhill), Soms., I. g. 474 (36). Clayton, Yorks., I. g. 981 (9). Clayton, John, I. g. 981 (9). -, Wm., I. g. 623 (24), 981 (9). Cleave, duke of. See Cleves. Clee, Linc., II. g. 327 (17). Cleeve (Cleve), Glouc., I. g. 226 (35). Clement VII., Pope (1523 to 1534, Julius de Medici), I. 723 (2 p. 411). Clement, Dr., the physician, II. 546 (pp. 297-8). -, John, I. 436 (f. 18). -, Wm., II. 231 (p. 121). Cleobury Mortimer (Clybury), Salop, I. p. 558. Clere, Sir John, captain of a ship, I. 200, 327 (2), 350, 368, 421, 478. -, Thos., I. 315, 327 (2), 368, 421, 489. Clergy, The (priests), I. 66 (4), 293, 390 (p. 228), 407. Clerk or Clerke, , II. 546 p. 312). -, Mr., bailey of Whetstone, letter to, II. 406. -, Edm., I. 553 :g. 100 (25). - (Clarke). Emmotte, I. g. 981 (14). 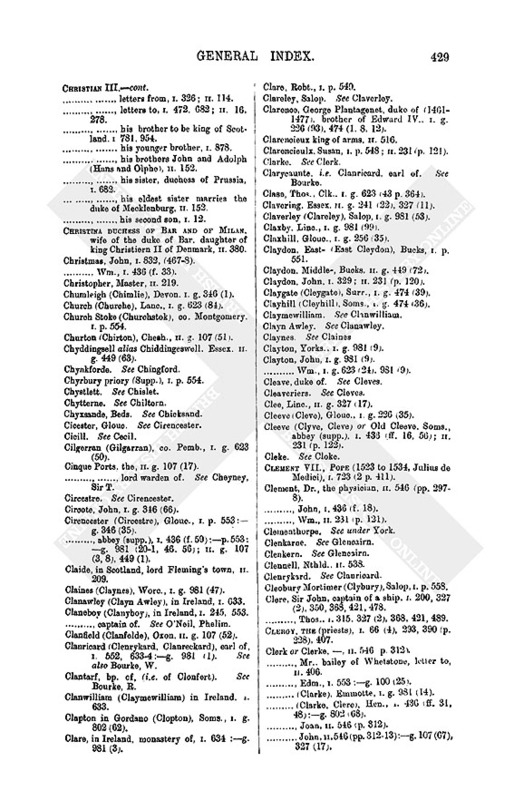 - (Clarke, Clerc), Hen., I. 436 (ff. 31, 48) :g. 802(68). -, Joan, II. 546 (p. 312). -, John, II. 546 (pp. 312-13) :g. 107 (67), 327 (17). - (Clarke), Thos., I. g. 100 (32), 981 (14). - (Clarke, Clerc), Wm., I. p. 550 :g. 981 (14). Clerkson, Mich., I. g. 226 (48 bis), 802 (77). Clervys, Ralph, II. 231 (p. 119). Cleveland, Yorks., I. 809, 884 :g. 226 (66). Cleverton (Cleverdon), Wilts, I. g. 623 (4, 10). -, II. 20, 43, 86, 96, 113, 129 (p. 71), 134 (p. 74), 140, 142, 152, 156, 183, 218, 250, 352, 385, 467 (p. 253) :App. 14. -, marshal of. See Rossem, M. von. Cleves, the town, II. 113. 140. -, II. 20, 25, 43, 55, 61 (p. 29), 73, 96-7, 126, 130, 140, 142-3, 151, 162, 168, 177, 179 (2), 183, 189-90, 210, 216, 224, 266, 278, 296, 305, 485 :App. 4 : g. 449 (22). -, -, his agreement with the Emperor, II. 143. -, -, his mother dies of grief, II. 126, 140. -, -, his wife. See Albret, Jeanne d'. Cleves, Anne of. See Anne. Cley, John, I. g. 981 (14). Cleyton, Hugh, I. g. 226 (93). Cliff or King's Cliff, Ntht., II. g. 449 (1). Clifford, Mr., of Aspeden, II. 297. Clifton, Westmld., I. g. 474 (14). -, II. g 107 (12). Clifton. Anne. I. g. 981 (77). -, Gervase, I. g. 981 (9, 94). -, Nich., I. g. 981 (77). -, II. 231 (pp. 119, 121, 123), 543 :g. 107 (33). Clist. Ash- (Aisheclist. Ayshclyst), Devon, II. g. 107 (50, 59). Clist, Broad- (Brodclyff, Brodeclyst), Devon, II. g. 107 (50, 59). Clitheroe (Clitherwe, Clyderhowe), Lanc., I. g. 346 (21), 623 (84). Clitheroe (Cletherowe), Hen., I. p. 552 :g. 346 (54). Cloatsley (Cloteley), Wilts, II. g. 529 (11). Clobeke, Yorks. See Clow Beck. Cloke, Cloake, or Cleke, Hen., II. 546 (pp. 313, 317). Cloncullen, in Ireland, I. 541. -, captain of. See McNamara, S.
Cloney, Ric., apparitor to the bp. of London, I. 538ii. Clonfert (Gloserten. Clonferten), bp. of, I. 633, 848. See Bourke, R.
Clonfert Brendon, mon. of ("De Portu Puro, Clonforten Civitatis"), I. 634. Clontarff, viscount. See Rawson, Sir J.
Clopton, Soms. See Clapton in Gordano. Close, Steph., I. g. 981 (21). -, II. 359 (2), 390. -, export of, I. g. 474 (26). -, shipping of (Act), II. 211 (p. 109). (coverlets), Act for making, I. 66 (14). (friezes and cottons), Act for making, I. 66 (15). (kerseys), II. 211 (p. 109). Clovel, Fras., I. 832 (p. 467). Clovyle, Kath., I. 436 (f. 25). Clow Beck (Clobeke), Yorks., I. p. 552. Cluny, in Scotland, II. 476. Clyde, the Scottish river, I. 810. -, from Newcastle, or sea-coal, I. 165, 186. Coal mines or pits, I. p. 552 :g. 476 (12), 981 (60). Cobbe or Cobbes, , a schoolmaster, I. 431, 500, 515. Cobert, John, I. g. 346 (65). Cobham, Kent, college (supp. ), I. 66 (c. 41), 436 (f. 58) :p. 551. -, II. 231 (p. 121), 265, 497, 504, 517, 543, 546 (pp. 321, 323). -, -, letter to, II. 497. Cobham, Anne Lady, wife of the preceding, I. 66 (c. 41). -, Sir Edw., II. 231 (p. 121). -, William. See Broke, Wm. Cockburn, in Scotland, II. 309. - (Cokburn), , a Scot, II. 469. - (Cokborn), Robyn of, II. 309. Cockburns (Cokborns), the Scottish family, I. 12. Cocke, John, II. 231 (p. 120). -, Thos., I. g. 346 (51). -, Wm., I. g. 474 (27). Cocken (Coken), Dham., II. g. 449 (3). Cockerham (Cokerham), Lanc., II. g. 107 (1), 241 (2). Cockermouth (Cokarmouth, Kokkermouth), Cumb., I. 185, 799. -, II. g. 107 (1, 40), 241 (2), 327 (19), 449 (16). -, prior. See Adamson, J.
Cockespitte manor, Devon, II. g. 107 (50). Cockfield (Cokefeld), Dham., I. g. 802 (66). Cockson (Coxsom, Coxton, Coxston, Coxson, Cokeson, Cokson), Thos., petty canon of Canterbury (died in 1543), II. 546 (pp. 301, 325, 328, 337, 343-4, 350, 352-4, 357-8, 364). Coddington, Notts, I. p. 555. Codicote, Herts, I. g. 981 (95). Codmer, Staff., II. g. 449 (31). Codrington, Dorothy, I. 436 (f. 9). Cogan, Gilb., I. g. 981 (54). -, II. g. 449 (63). Coggs (Cogges), Oxon, I. g. 100 (10), 981 (7). Coif (Cove), in Ayrshire, laird of. See Kennedy, T.
-, II. 231 (pp. 128, 130 bis). Cockborn or Cokborne. See Cockburn. Coke, Ant., I. 832 (p. 467). -, Ellen, I. g. 346 (65). -, Hen., I. g. 346 (65). -, II. g. 241 (32). -, Laur., I. g. 346 (65). -, Ric., I. p. 551 :g. 476 (4). -, Simon, I. g. 474 (34). Cokehill (Cockishill, now Cook Hill), nunnery (supp. ), in Inkberrow parish, Wore., I. 436 (f. 74). Cokesey, Wm., I. g. 100 (22). Cokett, Bridget, I. g. 226 (49). -, George, I. g. 226 (49). Cokram, Robt., II. g. 529 (19). Colbyme, Barth., I. g. 981 (75). -, II. 546 (pp. 314, 331, 370). -, grants dated at I. g. 802 (43), 981 (88). -, abbey (supp.) of St. John Baptist, I. g. 474 (5), 623 (83). -, -, abbot. See Marshall, T.
-, deanery of, II. App. 11. -, archd. of. See Curwen, R.
Colchester, John, abbot of St. Osithe, I. g. 474 (34). Colcombe park, Devon, II. g. 449 (6). Coldaston, Glouc. See Ashton, Cold. Coldeashbye, Ntht. See Ashby, Cold. Colden Knowes. See Cowden Knowes. -, II. 112, 132, 196, 214, 223, 309, 444. Coldred (Colrede), Kent, I 66 (c. 37). Coldrop (Colthrop, Colthopp), Berks., I. g. 981 (20, 46). Coldstream (Cawldstreme), in Scotland, II. 518. -, priory (burnt in 1542), I. 58. -, II. 231 (pp. 124 bis, 126). Cole, Dr. Henry, II. 546 (pp. 298-9). - Ric., I. 436 (f. 74). -, Thos., I. g. 802 (4). -, Wm., I. g. 802 (4). Coleham (Colneham), Salop, I. g. 981 (53). Colesbourn (Collesbourne) Magna, Glouc., II. g. 449 (45). Colesbourn (Collesbourne) Parva, Glouc., II. g. 449 (45). Coley (Colley), near Reading, Berks, II. g. 107 (69). Colier, John, II. 546 (p. 304). Coline, Simon de, the printer, II. 211 (p. 109). Collectors and receivers (Act), II. 211 (p. 110). College, the Northumberland river, II. 538. Colles, Hen., I. g. 226 (38). Collingham, Yorks., I. g. 981 (11). Collingwood, Hen., constable of Etal, I. 959. - (Collynwodd), Harry, II. 298. - (Collynwoode), John, I. g. 226 (31). -, II. 9,208, 217, 236 (2, 4), 295, 372. -, -, signature of, II. 236 (2, 4). - (Collynwoode), Ursula, I. g. 226 (31). Collins (Colyns), John, I. g. 226 (53). - (Collens), Robert, Cranmer's commissary (in 1537), II. 546 (p. 298). Collis (Collyce), Wm., prior of Oseney, I. p. 549. Collumpton (Colompton), Devon, I. g. 802 (37). Collyweston (Colyweston), Ntht., I. p. 552 : g. 100 (7). Colman, , II. 546 (p. 347). -, II. 546 (pp. 302, 304). Colnbrook (Colbroke), Bucks, II. g. 241 (3). Colnbrook (Colbroke) Midd., charter to, II. g. 107 (60). Coln St. Denis (Culme St. Denis), Glouc., II. g. 107 (47). Colne (Clone), Lanc, I g. 623 (79, 84). -, II. 25, 54, 73, 177, 183, 224, 385, 415. -, letters dated at, II. 73, 126, 142. -, "denunciation" by the Senate, II. 54. - Cathedral, dean and chapter, I. 77, 590. -, provost of, I. 519 (2p. 307). -, II. 25, 35, 73, 126, 143, 177, 179 (2), 415. Colonna, Ascanio, his son to marry Vittoria Farnese, I. 818. - (Columna), Camillo, II. 73. -, Signor Fabricio de, I. 688. - (Columna), Stefano de, II. 73. Colquhoun (Cochown), John, of Luss, signature of, I. 945. Colsell, Thos., I. g. 802 (33). - (Colsyll), Wm., I. g. 346 (66), 802 (33). Colston, Agnes, I. g. 981 (56). Colte, Geo., I. g. 226 (85). -, Robt., I. g. 802 (43). Colthorpe, Ntht., I. g. 474 (27 p. 283). Colthrop, Glouc., II. g. 107 (56). 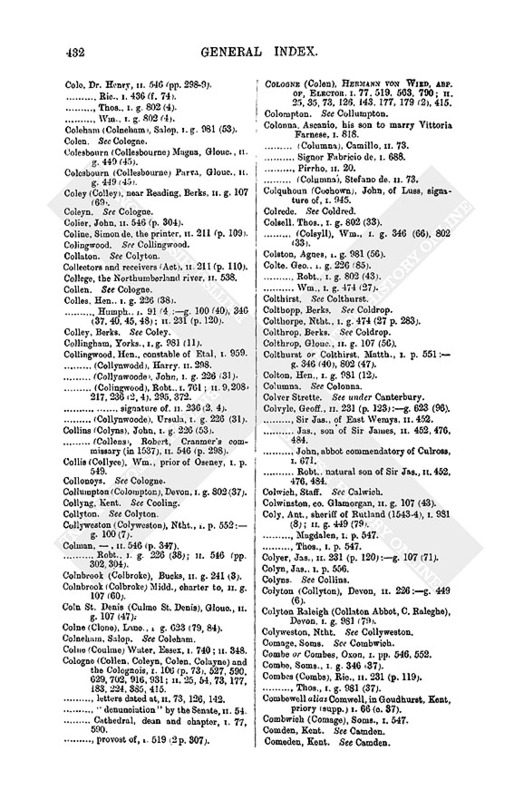 Colthurst or Colthirst, Matth., I. p. 551 : g. 346 (40), 802 (47). Colton, Hen., I. g. 981 (12). Colver Strette. See under Canterbury. Colvyle, Geoff., II. 231 (p. 123) :g. 623 (96). -, Sir Jas., of East Wemys, II. 452. -, Jas., son of Sir James, II. 452, 476, 484. -, John, abbot commendatory of Culross, I. 671. -, Robt. natural son of Sir Jas., II. 452, 476, 484. Colwinston, co. Glamorgan, II. g. 107 (43). -, Magdalen, I. p. 547. -, Thos., I. p. 547. Colyer, Jas., II. 231 (p. 120) :g. 107 (71). Colyn, Jas., I. p. 556. Colyton (Collyton), Devon, II. 226 :g. 449 (6). Colyton Raleigh (Collaton Abbot, O. Raleghe), Devon, I. g. 981 (79). Combe or Combes, Oxon, I. pp. 546, 552. Combe, Soms., I. g. 346 (37). Combes (Combs), Ric., II. 231 (p. 119). -, Thos., I. g. 981 (37). Combewell alias Comwell, in Goudhurst, Kent, priory (supp.) I. 66 (c. 37). Combwich (Comage), Soms., I. 547. Comes park, Beds, I. p. 545. Comhier monastery, co. Radnor, I. g. 981 (56). Comlyche, laird of, II. 309. -, order imposing it, I. 357. -, exemption granted to English merchants, I. 737. -, reply of the English ambassador, I. 757. -, reply to the English ambassadors' demand, I. 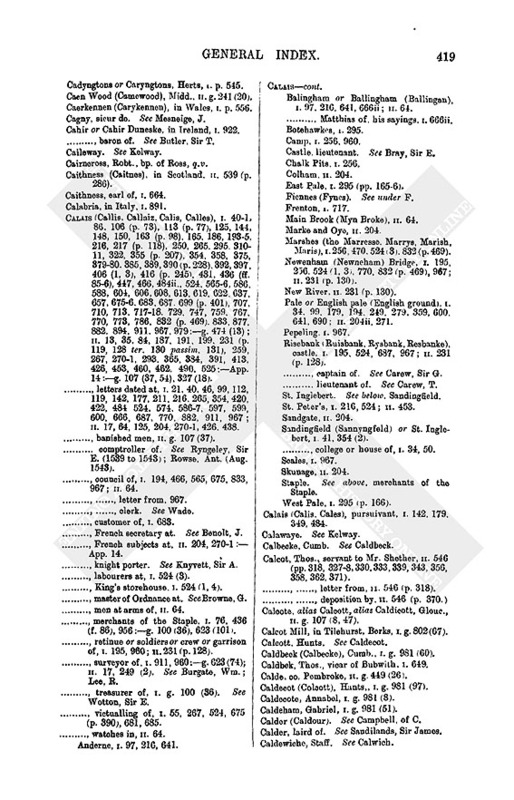 863.
Letters of marque against French subjects. See Letters of marque. Privilege to the Emperor's subjects, I. g. 475 (8). Compiegne (Compiennes), in France, I. 216, 403, 625, 640, 707. Compton, Nether-, Dors., I. g. 981 (78). Compton, Over-, I. g. 981 (78). Compton, Lady Eliz., wife of Philip Hoby, q.v. -, Walter, I. g. 476 (2). - Sir Wm., I. g. 802 (84). -, Wm., I. g. 981 (5). Confession, II. 546 (pp. 306, 310-13, 320, 331, 342, 352, 359). Coni (Cuny), in Piedmont, I. 62 (p. 40). Conisbrough (Cunnisburgh, Connesburgh), Yorks., I. g. 981 (65-6). Coningsby (Conesby), Linc., I. g. 470 (4). Conjurations (Act), II. 211 (p. 109). Connaught, in Ireland, I. 552, 633 :g. 981 (1). Connelagh, Nelun. See O'Neil. Neil Connelagh. Conowe, John, I. g. 476 (18). Conquet (la rade de Conquest), in Brittany, I. 40 (2), 662ii. Consistory of Cardinals. See Cardinals. Constable, Sir John, II. g. 449 (15). -, II. g. 449 (15). -, Sir Robert (executed at Hull 6 July, 1537), I. 437 (2). - Robt., I. g. 802 (87). -, II. 163, 194, 250, 261, 290, 338, 376. Contarini, Gaspar, Cardinal, Romish bp. of Salisbury (died 1542), I. 336. Convictions, Act for registration of, I. 66 (18). Convocation of Canterbury, II. 546 (p. 330). - account of proceedings, I. 167, 365. -, prolocutor. See Gwent, R.
Conwaye, Edw., I. g. 100 (15). -, Hugh, I. g. 100 (15). - (Conwey), John, I. g. 802 (6), 981 (103). - (Conwey), Reginald, I. g. 981 (103). Conyers, Sir Chr. lord, dec., I. g. 623 (26). -, Sir George, I. 884. - Jas., I. p. 555. - (Coniers), John lord, I. g. 346 (57). -, John, dec., I. g. 623 (8). -, Sir Wm., lord, dec., I. g. 623 (26). -, II. g. 241 (7). -, Hugh, abbot of Reading (executed in 1539), I. g, 346 (27), 474 (30). - John, II. g. 327 (20). -, Robt., II. g. 529 (6). -, Thos., I. g. 226 (80), 474 (13). -, Wm., 231 (p. 120) :g. 107 (25). Coole, Arthur, M.A., Canon of Windsor (1543), I. g. 623 (49). Cooling (Collyng), Kent. I. 66 (c. 41). Cooper, Hugh, II. 546 (pp. 310, 317). Coortope, , II. 546 (p. 358). Coote, Chr., II. 231 (p. 119). -, Jane, I. 436 (f. 74). Cootes, George, prb. of Chester, I. g. 346 (63). - (Kootes), Thos., I. g. 474 (27 p. 283). Coparcioners lands, the, I. g. 623 (11). Cope (Cooap), Mr., II. 508. 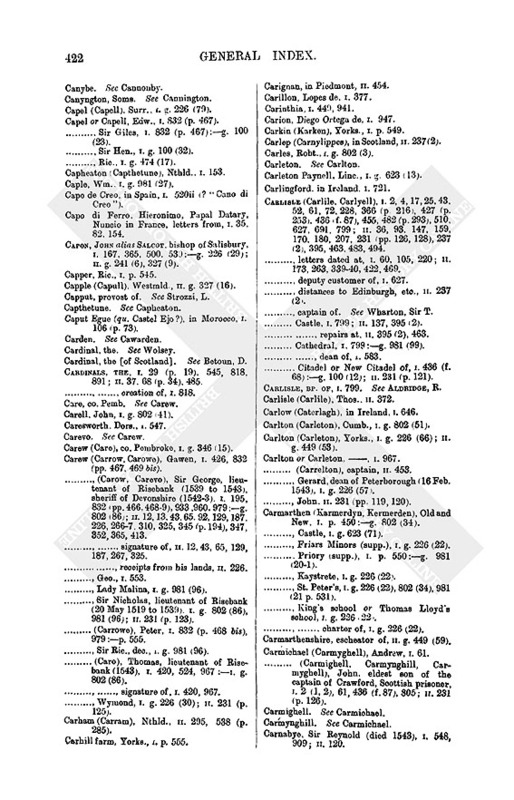 - (Cowppe, Cooppe), Ant., I, 352, 832 (p. 468) :g. 802 (35). -, Edw., I. g. 802 (78). -, II. 231 (p. 119), 391. -, -, letter from, II. 391. - (Coope), Margery, I. g. 100 (2). Copenhagen (Copman Havyn), in Denmark, I. 781. Copford, Essex, I. g. 100 (10). 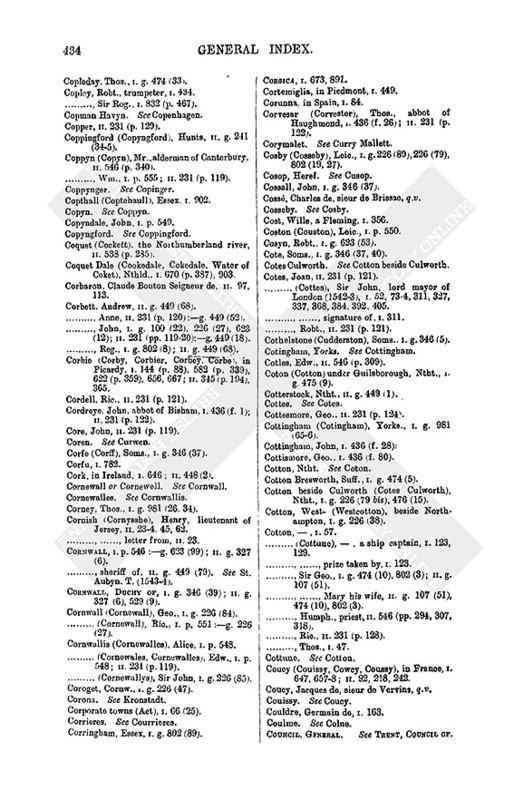 Copinger (Coppynger), Hen., I. g. 474 (12). - (Coppinger), John, letter from, II. 448. -, -, receipt by, II. 448. Copleday, Thos., I. g. 474 (33). Copley, Robt., trumpeter, I. 434. -, Sir Rog., I. 832 (p. 467). Copper, II. 231 (p. 129). Coppingford (Copyngford), Hunts, II. g. 241 (34-5). Coppyn (Copyn), Mr., alderman of Canterbury, II. 546 (p. 340). Copthall (Coptehaull), Essex, I. 902. Copyndale, John, I. p. 549. Coquet (Cockett), the Northumberland river, II. 538 (p. 285). Coquet Dale (Cookedale, Cokedale, Water of Coket), Nthld., I. 670 (p. 387), 903. Corbaron, Claude Bouton Seigneur de, II. 97, 113. Corbett, Andrew, II. g. 449 (68). -, Anne, II. 231 (p. 120) :g. 449 (52). -, II. 231 (pp. 119-20) :g. 449 (18). -, II. g. 449 (68). -, II. 345 (p. 194), 365. Cordell, Ric., II. 231 (p. 121). Core, John, II. 231 (p. 119). Corfe (Corff), Soms., I. g. 346 (37). Cornewall or Cornewell. See Cornwall. Corney, Thos., I. g. 981 (26, 34). Cornish (Cornysshe), Henry, lieutenant of Jersey, II. 23-4, 45, 62. -, -, letter from, II. 23. -, II. g. 327 (6). -, sheriff of, II. g. 449 (79). See St. Aubyn. T. (1543-4). -, II. g. 327 (6), 529 (9). Cornwall (Cornewall), Geo., I. g. 226 (84). - (Cornewell), Ric., I. p. 551 :g. 226 (27). Cornwallis (Cornewalles), Alice, I. p. 548. - (Cornewallys), Sir John, I. g. 226 (85). Coroget, Cornw., I. g. 226 (47). Corporate towns (Act), I. 66 (25). Corringham, Essex, I. g. 802 (89). Cortemiglia, in Piedmont, I. 449. Corunna in Spain, I. 84. 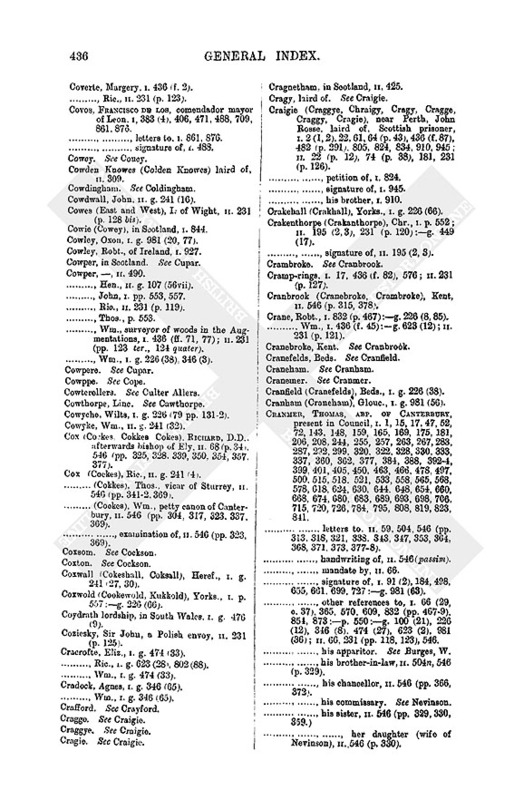 Cosby (Cosseby), Leic., I. g. 226 (89), 226 (79), 802 (19, 27). Cossall, John, I. g. 346 (37). Coss, Charles de, sieur de Brissac, q.v. Cost, Wille, a Fleming, I. 356. Coston (Couston), Leic, I. p. 550. Cosyn, Robt., I. g. 623 (53). Cote, Soms., I. g. 346 (37, 40). Cotes Culworth. See Cotton beside Culworth. Cotes, Joan, II. 231 (p. 121). - (Cottes), Sir John, lord mayor of London (1542-3), I. 52, 73-4, 311, 327, 337, 368, 384, 392, 405. -, Robt., II. 231 (p. 121). Cothelstone (Cudderston), Soms., I. g. 346 (5). Cotles, Edw., II. 546 (p. 309). Coton (Cotton) under Guilsborough, Ntht., I. g. 475 (9). Cotterstock, Ntht., II. g. 449 (1). Cottesmore, Geo., II. 231 (p. 124). Cottingham (Cotingham), Yorks., I. g. 981 (65-6). Cottingham, John, I. 436 (f. 28). Cottismore, Geo., I. 436 (f. 80). Cotton Bresworth, Suff., I. g. 474 (5). Cotton beside Culworth (Cotes Culworth), Ntht., I. g. 226 (79 bis), 476 (15). Cotton, West- (Westcotton), beside Northampton, I. g. 226 (38). - (Cottune), , a ship captain, I. 123, 129. -, -, prize taken by, I. 123. -, -, Mary his wife, II. g. 107 (51), 474 (10), 802 (3). -, Humph., priest, II. 546 (pp. 294, 307, 318). -, Ric., II. 231 (p. 128). -, II. 92, 218, 242. Coucy, Jacques de, sieur de Vervins, q.v. Couldre, Germain de, I. 163. Council. General. See Trent, Council Of. -, II. 19, 27, 39, 41, 55, 63 (p. 31), 83, 88-9, 94, 101, 118, 121, 130, 132, 134 (pp. 73-4), 135, 156, 163, 175, 179 (2), 184, 192, 199, 211 (p. 110), 223-5, 231 (pp. 127, 130), 232, 234, 245, 248, 254, 266, 280, 283, 303-4, 311-12, 321 (p. 181), 333-5, 339, 345 (p 194), 353, 370 (pp. 204-5), 379, 432, 438, 446, 457-8, 463, 488, 513, 516, 546 (pp. 291, 295, 312, 316, 320, 324-32, 335-7, 339-40, 343, 346-7, 350-1, 353, 359-60, 362, 364, 368-9, 376-7) :App. 4, 14 :g. 241 (6). -, II. 2, 21, 29, 33, 57, 69, 70, 74-5, 84, 87, 93, 99, 100, 108, 155, 185, 191, 196, 212, 216, 256, 269, 279, 285, 314, 317, 324, 331, 394-5, 410, 413, 442, 450, 459, 473, 487, 504, 521. -, -, letter from two members, II. 521. -, II. 3, 5, 11, 18, 34, 50, 63, 92, 119-20, 136, 141, 144-5, 159, 170, 180, 188-9, 195, 204, 207, 220-2, 236, 244, 249, 262, 267, 270, 276-7, 281-2, 287-8, 302, 318-19, 323, 325, 343, 349, 359, 361, 377-8, 385, 408, 414, 417, 423, 426, 433-4, 443, 445, 453, 455, 461, 494, 502, 519, 522. -, -, members left in London, letter from, I. 655, 661, 681, 699, 727-8, 746. -, -, -, letter to, I. 675. -, -, warrant by, II. 83. -, -, acting clerk. See Mason, J. -, -, clerks of (two). See Mason, J.
Counterfeit tokens (Act), II. 211 (p. 109). Countours, the. See under London. Courrieres (Corrieres, Currieres), Philip De Montmorency Sieur De, captain of the Emperor's Almain guard, envoy to England (Aug.Nov. 1542), I. 44, 69, 544, 563, 608, 722 (p. 409), 731, 742, 756, 829, 878, 898, 931, 969. -, II. 4, 101, 103, 121, 123, 134 (p. 74), 160, 197, 254, 308, 333, 348, 383, 426, 440-1, 458, 479, 488, 504, 530, 542, 546 (pp. 298,318, 327, 329, 331-3, 335, 350-1, 356, 370) :App. 14. -, -, bloodshed within (Act), II. 211 (p. 109). -, -, proclamation against vagabonds, etc., II. 542. Courte, Robt., I. g. 346 (37). Courteney, Thos., II. 231 (p. 121). Courteville, Glodoe, II. g. 107 (6). Courthop, Jas., M.A., I. g. 474 (35). Courtmaster, the [of the English merchants at Antwerp]. See Castelyn, W.
-, II. 231 (pp. 119-20). -, mayor of, I. g. 226 (9). -, II. g. 107 (9). -, II. g. 529 (23). -, city gaol, I. g. 100 (30). -, bp. of. See Lee, R.
Coventry and Lichfield, bpric. of, I. 121, 234 :g. 226 (12, 14), 346 (8, 31), 623 (2, 39, 44). -, dean and chapter. See Lichfield cathedral. Coverte, Margery, I. 436 (f. 2). -, Ric., II. 231 (p. 123). Covos, Francisco De Los, comendador mayor of Leon, I, 383 (4), 406, 471, 488, 709, 861, 876. -, -, letters to, I. 861, 876. -, -, signature of, I. 488. Cowden Knowes (Colden Knowes) laird of, II. 309. Cowdwall, John, II. g. 241 (16). Cowes (East and West), I. of Wight, II. 231 (p. 128 bis). Cowie (Cowey), in Scotland, I. 844. Cowley, Oxon, I. g. 981 (20, 77). Cowley, Robt., of Ireland, I. 927. Cowper, in Scotland. See Cupar. -, Hen., II. g. 107 (56vii). -, John, I. pp. 553, 557. -, Ric., II. 231 (p. 119). -, II. 231 (pp. 123 ter., 124 quater). -, Wm., I. g. 226 (38), 346 (3). Cowyche, Wilts, I. g. 226 (79 pp. 131-2). Cowyke, Wm., II. g. 241 (32). Cox (Cockes, Cokkes Cokes). Richard, D.D., afterwards bishop of Ely, II. 68 (p. 34), 546 (pp. 325, 328, 339, 350, 354, 357, 377). Cox (Cockes), Ric., II. g. 241 (4). - (Cokkes), Thos., vicar of Sturrey, II. 546 (pp. 341-2, 369). 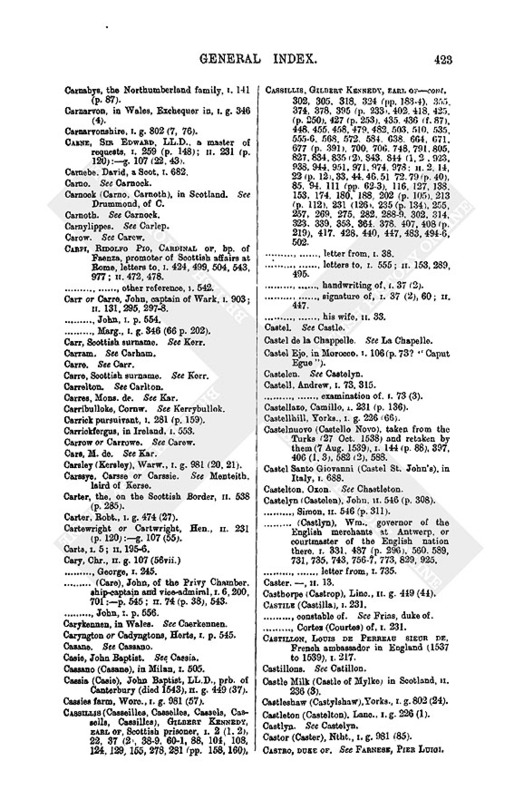 - (Cockes), Wm., petty canon of Canterbury, II. 546 (pp. 304, 317, 323, 337, 369). -, -, examination of, II. 546 (pp. 323, 369). Coxwall (Cokeshall, Coksall), Heref., I. g. 241 (27, 30). Coxwold (Cookewold, Kukkold), Yorks., I. p. 557 :g. 226 (66). Coydrath lordship, in South Wales, I, g. 476 (9). Coziesky, Sir John, a Polish envoy, II. 231 (p. 125). Cracrofte, Eliz., I. g. 474 (33). -, Ric., I. g. 623 (28), 802 (88). -, Wm., I. g. 474 (33). Cradock, Agnes, I. g. 346 (65). -, Wm., I. g. 346 (65). Cragnetham, in Scotland, II. 425. Cragy, laird of. See Craigie. -, II. 22 (p. 12), 74 (p. 38), 181, 231 (p. 126). -, -, petition of, I. 824. -, -, his brother, I. 910. Crakehall (Crakhall), Yorks., I. g. 226 (66). -, II. 195 (2,3), 231 (p. 120) :g. 449 (17). -, -, signature of, II. 195 (2, 3). Cranbrook (Cranebroke, Crambroke), Kent, II. 546 (p. 315, 378). Crane, Robt., I. 832 (p. 467) :g. 226 (8, 85). Cranfield (Cranefelds), Beds., I. g. 226 (38). Cranham (Craneham), Glouc., I. g. 981 (56). Cranmer, Thomas, abp. Of Canterbury, present in Council, I. 1, 15, 17, 47, 52, 72, 143, 148, 159, 165, 169, 175, 181, 206, 208, 244, 255, 257, 263, 267, 283, 287, 292, 299, 320, 322, 328, 330, 333, 337, 360, 362, 377, 384, 388, 392-4, 399, 401, 405, 450, 463, 466, 478, 497, 500, 515, 518, 521, 533, 558, 565, 568, 578, 618, 624, 630, 644, 648, 654, 660, 668, 674, 680, 683, 689, 693, 698, 706, 715, 720, 726, 784, 795, 808, 819, 823, 841. -, -, letters to, II. 59, 504, 546 (pp. 313, 318, 321, 338, 343, 347, 353, 304, 368, 371, 373, 377-8). -, -, handwriting of, II. 546 (passim). -, -, mandate by, II. 66. -, -, signature of, I. 91 (2), 184, 498, 655, 661, 699, 727 :g. 981 (63). -, II. 66, 231 (pp. 118, 123), 546. -, -, his apparitor. See Burges, W.
-, -, his brother-in-law, II. 504n, 546 (p. 329). -, -, his chancellor, II. 546 (pp. 366, 372). -, -, his commissary. See Nevinson. -, -, -, her daughter (wife of Nevinson), II. 546 (p. 330). -, -, his steward. See Markham. -, II. 546 (p. 299). -, Edmund, archdeacon of Canterbury, II. 546 (p. 300). Crateford, Hugh, clk., I. g. 981 (35). -, Humph., I. g. 981 (35). -, Mary. I. g. 981 (35). Craton castle, in Scotland, II. 181. Craultons manor, Bucks, I. g. 623 (18). Crawe, Jas., I. p. 556. Crawford (Crayforde) Magna, Dors., II. g. 449 (1). Crawford (Crayforde), earl of, I. 827 (p. 465). Crawford (Crawforthe, Crawfurthe), captain of, I. 2 (2), 805 (p. 458). Crawford (Crawfurde), Edw., a Scot, I. 682. Crawfordjohn castle, in Scotland, II. 361. Cray, North-, Kent. I. p. 557. Crayford (Crafford), Guy, I. g. 226 (60). Craythorne, Jas., I. g. 623 (8). Creaton (Credon, Creton), Ntht., II. g. 107 (55). Creeping the Cross on Good Friday, II. 546 (pp. 293-5, 330-1, 304, 307-8). -, letters dated at, I. 723, 738. Crequi (Kerquey, Kerkey), Mons. de, I. 249, 557, 562, 569. Crerkenwell (i.e. Clerkenwell). See under London. Cresaker or Cresacre, near Ardres, I. 569, 574. Cressingham Parva, Norf., II. g. 449 (4). Cressy, in France, II. 242. Crevecoeur (Crevecure), in Cambresis, II. 337, 345 (p. 194), 380, 384. -, letter dated at, II. 365. Crewkerne (Crokhorn), Soms., I. g. 100 (30). Cribhede, on the Scottish Border, II. 538. Crichton, Robt., bp. of Dunkeld, I. 801. Crimibilhome, Ric., I. g. 623 (79). Crippes (Cryppys), Mr., II. 546 (p. 367). - (Cryppys), Hen., II. 546 (p. 362). - (Cripps), Ric., I. g. 623 (23). Crispe, Thos., I. g. 226 (79 p. 131). Croatia and the Croats (Curvates), II. 163. Crocher, Hen., I. g. 226 (79 p. 131). -, Wm., I. g. 226 (79 p. 131). Crodon (Croyden, Croydon), in Brittany, I. 40 (2), 91 (3). Croftes, Sir Edw., I. g 100 (22), 226 (27-8, 84). Crofton, Yorks, II. g. 449 (47), 981 (9, 19). Crofton Bridge, Bucks, I. g. 226 (79 p. 131). Croisic (Crosewyke) or Le Croisic, in Brittany, I. 456. Croke, John, II. 231 (p. 120). Crokeker, John, I. g. 226 (79 p. 131). -, II. 12, 13, 43, 65, 92, 129, 187, 231 (p. 120), 267, 325, 389 : App. 14. -, -, signature of, II. 12, 43, 65, 129, 187, 267, 325. -, II. 231 (pp. 119, 122, 125, 128, 131) : g. 107 (28). Cronton (Croenton), Lanc., II., g. 107 (1). Crookham (Crokeham), Berke., I. g. 981 (20-1). Croom, Earls-, alias Croom Symondes (Crombesymons), Wore., II. g. 449 (8). Cropton, Yorks., II. g. 327 (1). Crosby Banke, Westmld., II. g. 107 (8). -, II. g. 241 (14). Crosier, Clement, I. 888, 921. Crossbows and hand-guns (Act), II. 211 (p. 109). Crosse, Eliz., I. g. 981 (56). 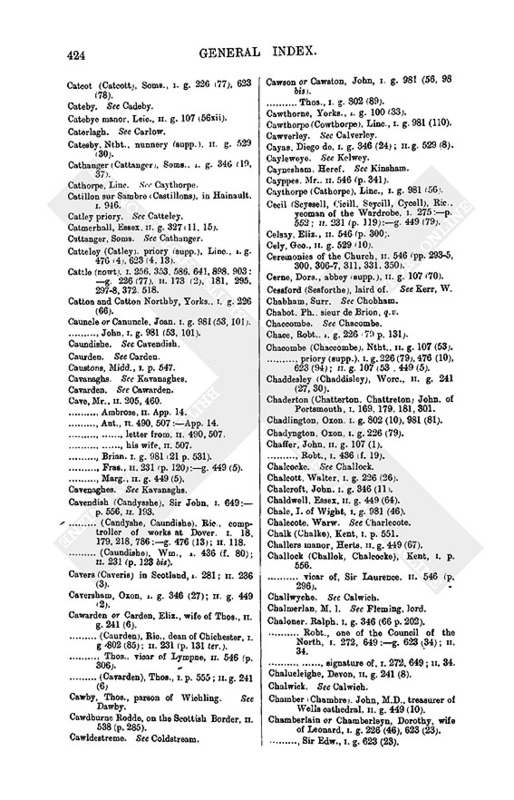 -, (Cros), John, cellarer, of Christchurch, Canterbury, II. 546 (pp. 297, 303). -, John, I. g. 981 (68). -, Robt., I. p. 556. -, Thos., I. 436 (f. 52). Crosses, casting down of, I. 420. Crotoy, Crotoye, or Crottoy. See Le Crotoy. 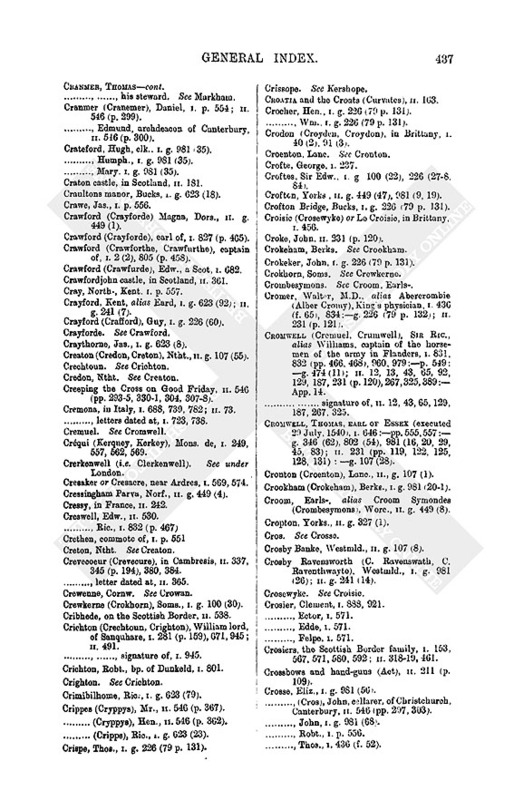 Crowan (Crewenne), Cornw., I. p. 555. Crowche (Crouche), Wm., II. g. 107 (30), 449 (49). Crowdale alias Crowdishole manor, Hants, II. g. 107 (39). Crowelton or Croughton, Ntht., I. g. 981 (56, 86). Crowland (Croyland), Linc., I. p. 554. -, abbey (supp.) I. 436 (pp. 28, 55) : pp. 547, 554 :g. 981 (49), II. 231 (pp. 122-3) :g. 107 (9, 39). -, -, abbot. See Bridges, J. Crown Lands, commission for sale of, I. g. 623 (29). -, a survey of, I. 436 (f. 75). Croxden (Croxeden, Croxston), Staff., abbey (supp. ), I. g. 346 (65), 981 (53, 63). -, II. 231, (p. 122). Croy, Adrien De, Sieur De Roeulx, q.v. Croyden, or Croydon, in Brittany. See Crodon. -, II. 546 (p. 322, 349, 375). -, letter dated, II. 66. Cruche, Hen., II, g. 107 (48). Crucheley (Crowccheleye), Eliz., I. 436 (f. 4). Cruciger, Gaspar, letter from, I. 653. -, letter to, I. 590. Crues, Agnes, I. g. 474 (34). Cruse, -, II. 546 (p. 296). -, Laur., I. g. 802 (55). Crusshe, Robt., I. g. 802 (39). Cryche, Hen., II. 231 (p. 120). Cryke, co. Glamorgan, II. g. 107 (19). Crykener, Erasmus, II. 231 (p. 120). Cubley, Yorks. II. g. 107 (8, 45). Cuddington, Ric., I. 832 (p. 467). Cuerersich, in Juliers, II. 126. Culme St. Denis. See Coln St. Denis. Culmere, Hants, I. g. 226 (75). Culpeper, Sir Alex., I. 66 (c. 37). -, Eliz., I 66 (c. 37). -, J. II. 546 (p. 318). -, Mary, II. 231 (p. 123). -, Thos., attainted, I. g. 802 (53). Culross abbey, in Scotland, II. 128. -, abbot of. 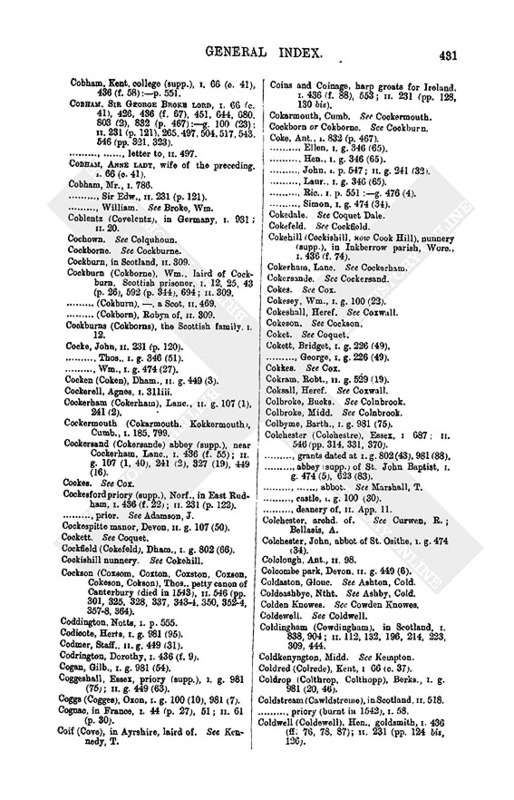 See Colvile, J.
Culter Allers (Cowterellers), near Biggar, in Scotland, II. 339. Culworth, Ntht., I. g. 226 (79). Cumberland, I. 645, 800 :g. 623 (56, 95), II. 236-7. -, II. g. 449 (79). See Salkelde, Thos. (1543-4). -, -, signature, I. 61. 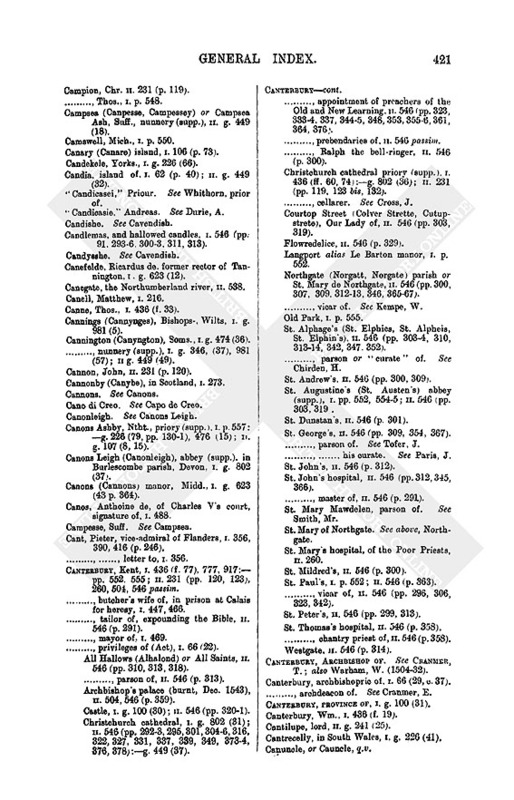 -, -, livery of lands to, I. g. 623 (40). Cumnock, in Scotland. See Dunbar, Alex. Cunningham, Alex., eldest son of the earl of Glencairn, I. 61. - (Cwnyngame), John, of Caprington, signature of, I. 945. -, Robert, younger son of the earl of Glencairn, I. 61. -, Wm., earl of Glencairn, q.v. Cunscough (Counscough), Lanc., II. g. 107 (1). Cupar (Cowpere) abbey, in Scotland, I. 26 (3). -, II. 188, 476, 491. Cupper, , collector of subsidy, I. 24. -, Ric., I. g. 100 (32). Curfford, Ric., II. g. 449 (38). Curry Mallett (Corymalet), Soms., I. g. 346 (39). Cursebeck, in Juliers, II. 126. Curson, David, I. 436 (f. 4). -, Ric., I. g. 226 (25), 474 (32). -, Robt., I. 832 (p. 467) :g. 100 (21). Curtes, Robt., I. g. 981 (85). Curthop', Anne, I. g. 623 (48). Curwen, Chr., I. g. 623 (95). -, John, serjeant at arms, II. g. 327 (4). - (Coren), Ric., King's almoner, archd. of Colchester, &c. (died 1543), I. g. 346 (52, 62), 474 (3). -, Sir Thos. (died 1543), II. 195 (2, 3), 332, 395. -, -, other references, I. 848. Cusop (Cosop), Heref., II. g. 449 (7). Cust, co. Carmarthen, I. p. 556. Cutler, , I. g. 981 (99).